1.0 Scope - This section covers the design, material, fabrication, shipment and erection of arch-based building systems. All material, erection and field work included and excluded shall be in accordance with the "Code of Standard Practice" of the building construction industry. 2.0 Description - All the various models of buildings listed below utilize the basic bolted arch panel concept to form spans of various shapes. The pre-punched panel bolted construction can be utilized for permanent structures or be easily dismantled for reassembly with virtually no damage to the members. This portability is an added feature not normally encountered in the pre-engineered building field. 2.1 Building Size - Building sizes range from 10' wide spans in our Mini models up to unlimited widths in our "multi-span" arch systems. Lengths are unlimited, based on 18" increments for the Mini building and 2'-0" for all other models. Peak heights and sidewall clearances vary for different model types and cover a wide range of combinations. 2.2 Building Type - (a) Arch Models: A single radius clear span arch structure. Standard sizes range from 19' wide to 100' wide with height being limited to 1/2 span or less. (b) Open Sided: A single radius, partial arch structure, clear span with structural frame supports on open side. Standard sizes range from 19' wide to 50' wide with open side clearances of 8', 10', 12', 14', 16' and varying bay spacing. (c) S Series: A straight sided, multiple radius clear span arch system. Standard sizes range from 20' wide to 60' wide, with straight sides and varying center heights. (d) G Series: A straight roof, straight-sided clear span building system with a uniform roof slope of 18 degrees. Standard sizes range from 20' wide to 40' wide with varying center heights. (e) A Series: A straight roof, with a uniform roof slope of 18 degrees, straight side panels angled at base. Standard sizes range from 20' wide to 50' wide with varying center heights. (f) Roof Systems: A single radius clear span low profile arch structure designed to act as a roof system utilizing conventional wall designs as sidewall support. Standard sizes range from 30' wide to 90' wide with heights in the 10' to 30' region. (g) Multiple Arch Spans: A series of single radius arch structures sharing a common structural support system as an interior wall. Standard sizes range from 30' to 70' wide for each individual span, joined side by side in any number of combinations from double span to triple span and upward. (h) Conveyor Covers: Either single radius or multiple radius clear span arch structures designed to cover standard single or double conveyors and acting as a gallery. Standard sizes range from 10' wide to 30' wide with heights and sidewall clearances to accommodate any combination of conveyor and walkway systems. (i) Mini Buildings (Security Shelters): Single radius clear span arch structure with straight sides. Designed to provide tamper proof, secure cover for remote storage locations such as well-head valves, oil field storage, etc. Standard sizes range from 10' wide to 20' wide with various peak heights to suit different applications. 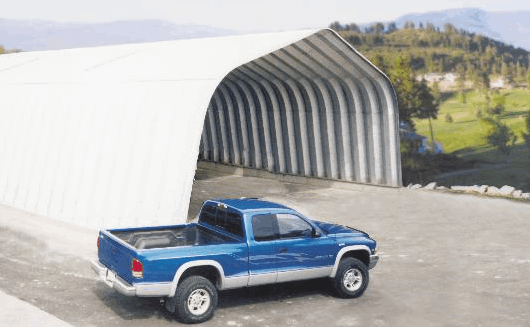 2.3 Arch Structures - All arch structures, other than Mini Buildings, utilize our standard 2'W X 10'L corrugated pre-punched panels as the basis of the design. Panels are cold formed to various radii as required and bolted together to achieve the desired span. Panels are gang punched to ensure uniformity of manufacture and ease of assembly. 2.4 Endwall Systems - All endwalls are designed using our standard 18" center 3 1/4" deep corrugated, pre-punched panels to form various end wall arrangements as required. By altering the pattern of panels, any size opening can be achieved to accommodate roll-up, overhead, swing or sliding door systems. 2.5 Building Loading: -General Basic design loads shall include live, snow, wind and earthquake (if applicable) in addition to dead load. All loading shall be in accordance with the governing building code as prescribed by local building authorities. Snow and Wind Load Design snow and wind load shall be based on the specified ground snow load and wind pressure respectively. Distribution of loading over the building envelope shall be in accordance with the applicable governing building codes for the location involved. Seismic Loads If applicable, the effect of dynamic loads must be considered in combination with other loads. 3.0 Design and Plans - Plans and Specifications The manufacturer shall submit plans and specifications in sufficient detail to establish the design of the structure under consideration, including but not necessarily limited to, all loading conditions, material grades and geometry of the panel section. Design Certification upon request, the manufacturer shall furnish a letter of design certification signed and sealed by a registered professional engineer. 4.0 Materials - Materials shall be new and shall meet or exceed the mechanical and physical properties required by the design and the fabrication process. 4.2 Fabrication - Fabrication tolerances shall not exceed those recommended by the governing building codes. 5.0 Arch Systems Materials - Basic arch panel structures are available in the following material: Super Galvalume Plus – 24Ga. to .16Ga. AZ60/180 Galvalume Plus steel (Heavy Commercial Coating with 30 Year Warranty) passivated with regular mill finish. 5.2 Sealant - Manufacturer shall provide, when requested, quality metal building tape sealant for all roof seams and joints. Sealant is a butyl rubber compound used to seal panels against air, dirt, ice and water. Material is compatible with most plastics, foams, rubber and other metal building components. 5.3 Trim and Flashing - Special manufactured standard double angle flashing system is utilized at all end wall to roof transitions. Flashing is made from heavy gauge steel to provide some structural stability as well as finishing features. 6.0 Accessories - Manufacturer provides a complete array of standard accessory items available for all structure types. 6.1 Swing Doors - Construction - Pre-hung 4' X 7' panel assembled door suitable for padlock type closure. 6.2 Sliding Doors - Top-hung heavy-duty panel construction, with 14 gauge framing and 22 gauge corrugated door panels. Doors are equipped with pull handles, heavy-duty ball bearing rollers, interlocking edge, bottom seals, latch and lock device. 6.3 Hangar Doors - Manufacturer has a full range of standard double track top hung sliding hangar doors. Construction is as standard sliding doors, and leafs are on a double track system to allow for partial opening. Sizes range from 30' to 80' in width – in heights of 10'-0" to 20'-0". 6.4 Sectional Overhead Doors and Roll Up Doors - Framed openings shall be all steel heavy-duty bolted construction. Type of door, hardware required and glazing shall be furnished, installed and painted by others. 6.5 Skylights, Door Lights, and Wall Lights - Manufacturer has a wide variety of fiberglass panels formed to the shape of the basic building components. Material is a quality 12 oz., 16 oz., or 24 oz. fiberglass panel designed to install as a replacement for standard steel sections for ease of erection. 6.6 Ventilators - Continuous circular gravity type 12" diameter ventilator or 12" diameter turbine ventilators utilizing heavy duty ball bearing type shafts for quiet long lasting service. 6.7 Roof and Wall Insulation - Arch type structures are compatible with all conventional insulation methods – spray on, fiberglass rolls or rigid foam. 7.0 Warranties: - Manufacturer's Warranty shall warrant the following: 1) All buildings are designed in accordance with the local governing building code to withstand the published wind and snow loadings when provided by the seller to the manufacturer. 2) All materials will be free of defect in material and workmanship. 8.0 Shipping - All arch structures have unique compact stacking capability due to the nesting of the standard panel components. This stacking feature greatly reduces the bulk found in normal building construction and reduces freight costs. 9.0 Erection - The manufacturer supplies detailed comprehensive erection guides and blueprints for all building models. These erection guides contain valuable information to minimize construction problems and speed up installation.